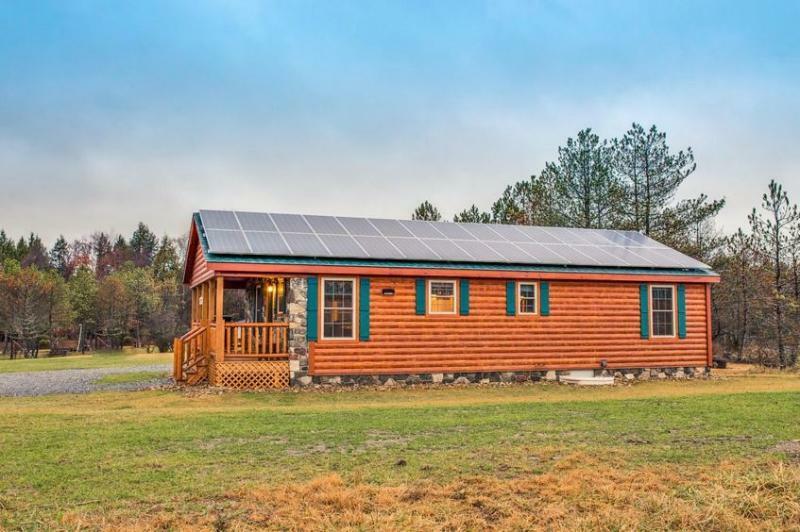 Lovely Newly Built 3BR Benezette Cabin w/Wifi, Indoor/Outdoor Fireplaces & Gorgeous Mountain Views - Easy Access to Wineries, Restaurants, Elk Viewing Areas & More! 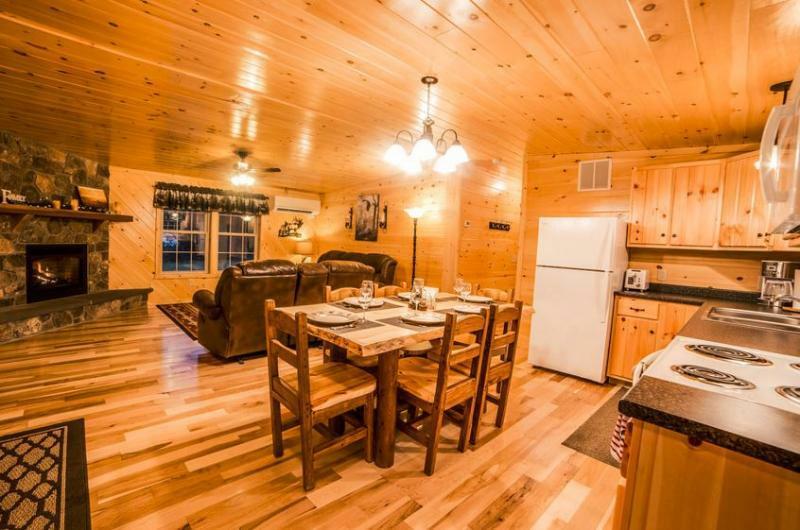 If you’re searching for the perfect place to escape the hustle and bustle of everyday life, look no further than this lovely Benezette vacation rental cabin. 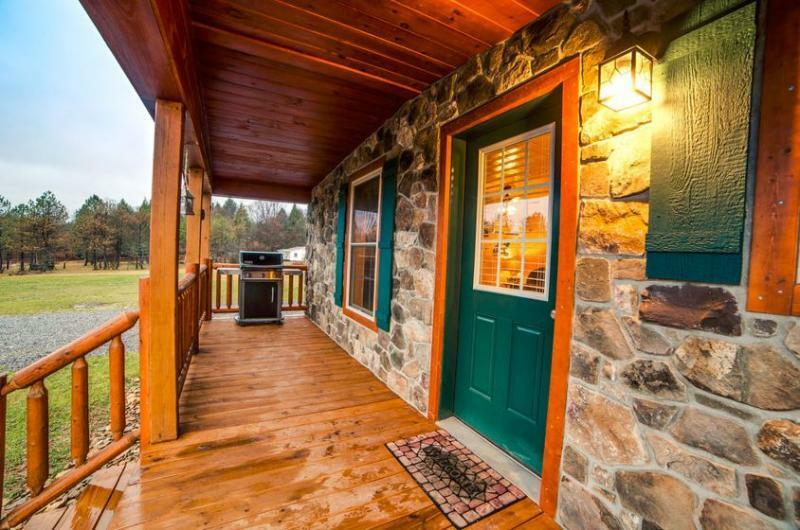 Nestled in a serene setting with plenty of peace and quiet yet still situated close to many popular area attractions, this delightful abode will serve as your ultimate home-away-from-home during your next Pennsylvania getaway! 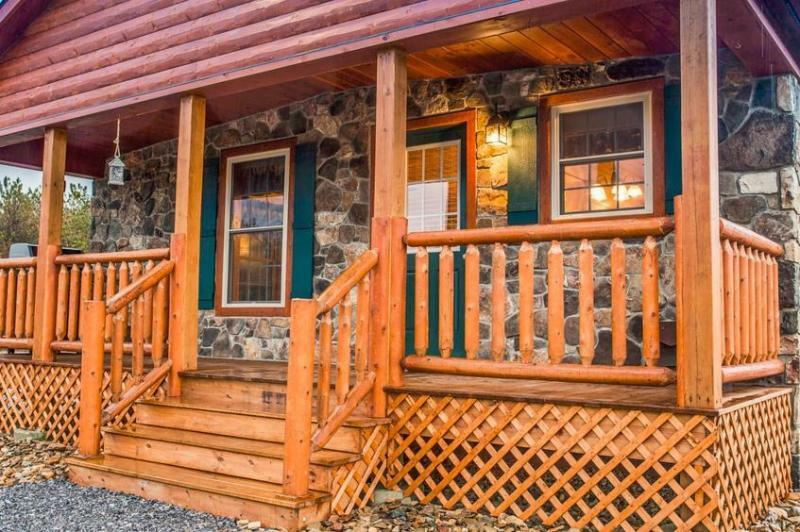 With 3 bedrooms, 1 bathroom, and 1,050 square feet of well appointed living space, this spacious residence is an ideal accommodation choice for families, friends, or couples out for a rejuvenating retreat. 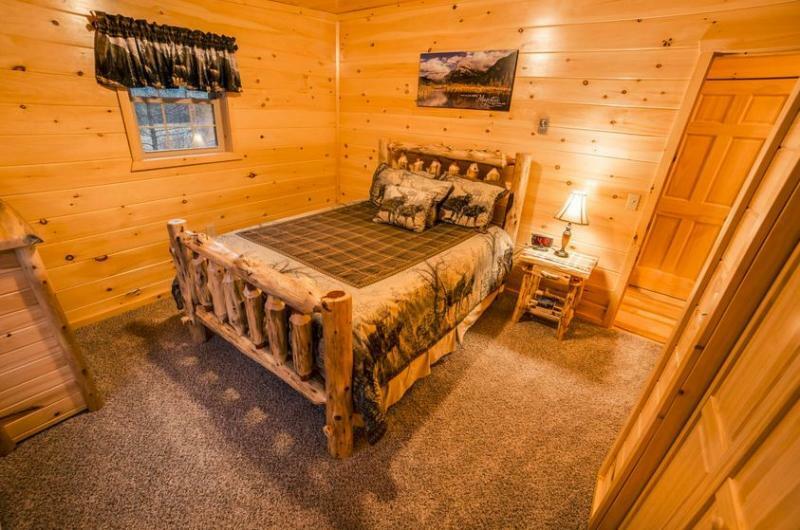 The property’s enchanting location boasts beautiful mountain views to the west and frequent elk sightings, situated on 1.5 acres of lush grass, dotted with towering trees. 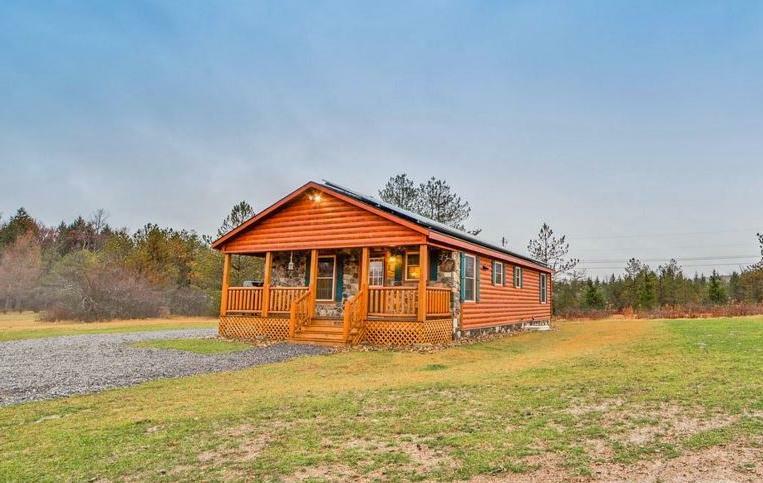 There's certainly plenty of room to play and relax out here, with terrific features such as an outdoor fire ring, quaint picnic table, benches, and an expansive front porch. 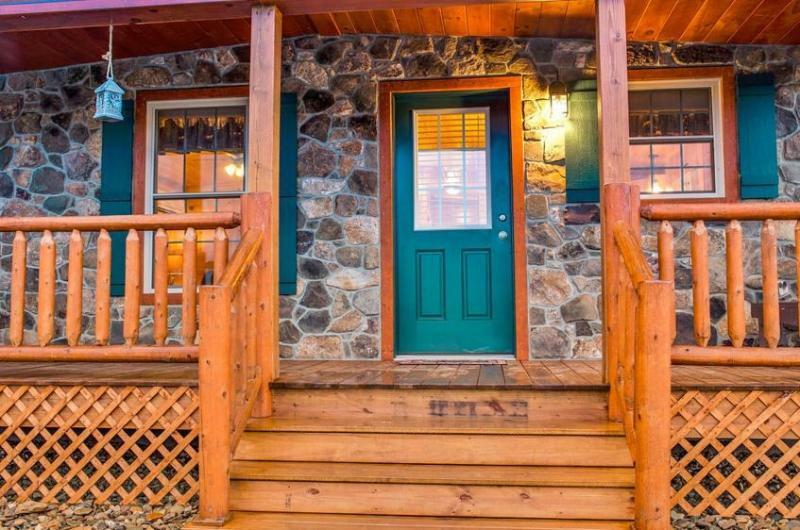 Look forward to spending memorable evenings outside on the porch, glass of wine in hand, watching the fiery sun disappear behind the trees. 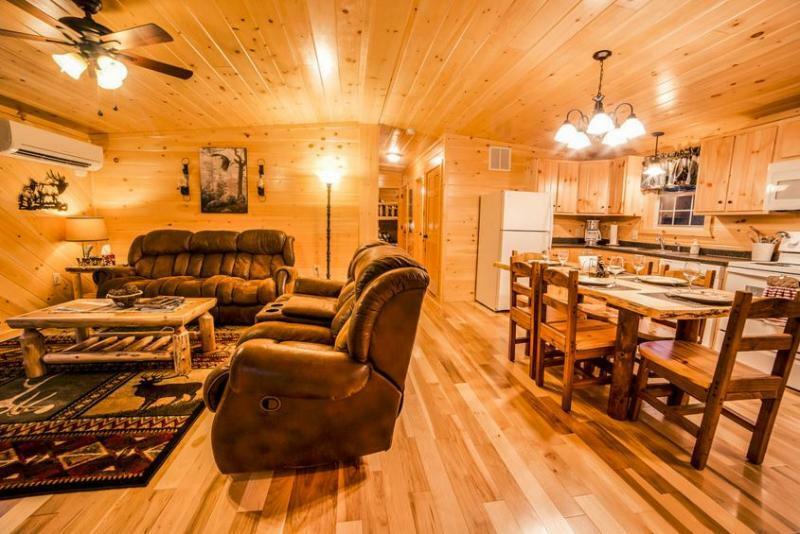 As soon as you first walk into the cabin's welcoming open floor plan, you’ll feel right at home! 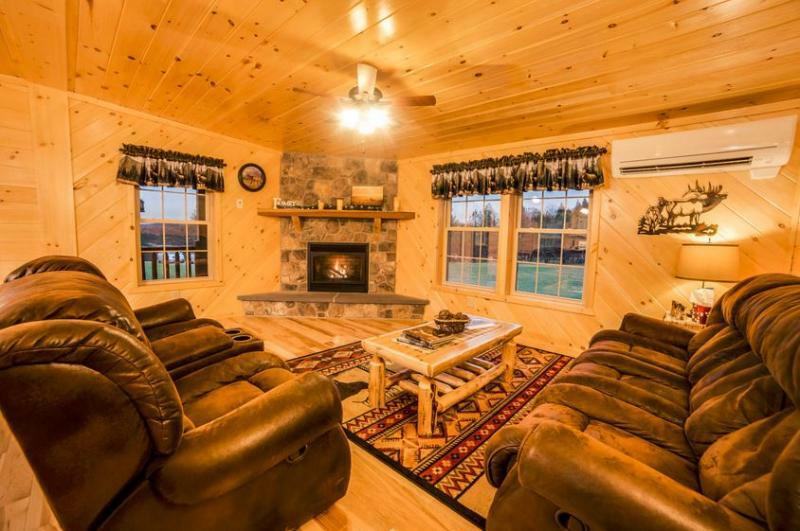 Large windows fill the entire great room with an abundance of glorious natural light, as well as provide occasional glimpses of grazing elk outside. 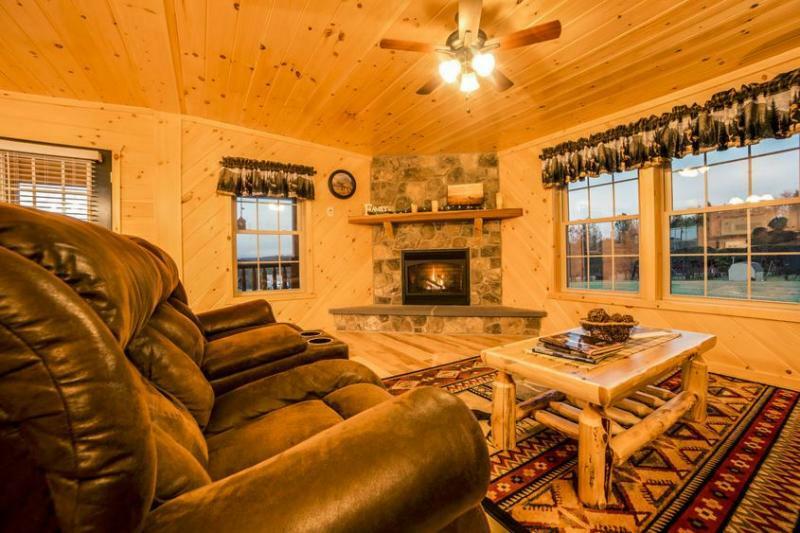 The interior evokes a wonderfully relaxing feel, adorned with cozy touches like a beautiful stone propane fireplace, hardwood floors, tongue and groove pine walls and ceilings, and rustically charming log cabin furniture. 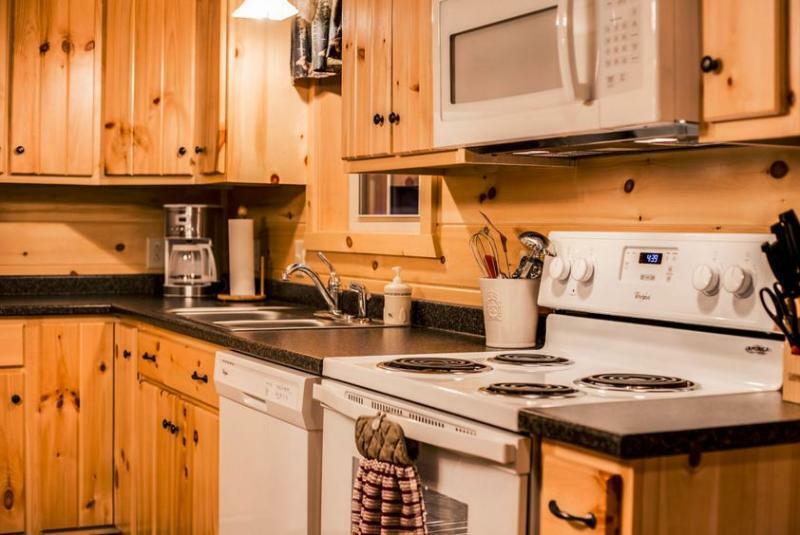 You’ll be delighted to find every modern convenience you could possibly need to be comfortable here, including wireless internet access, Verizon network extender, air conditioning, central heating, and in-unit laundry machines for your convenience. 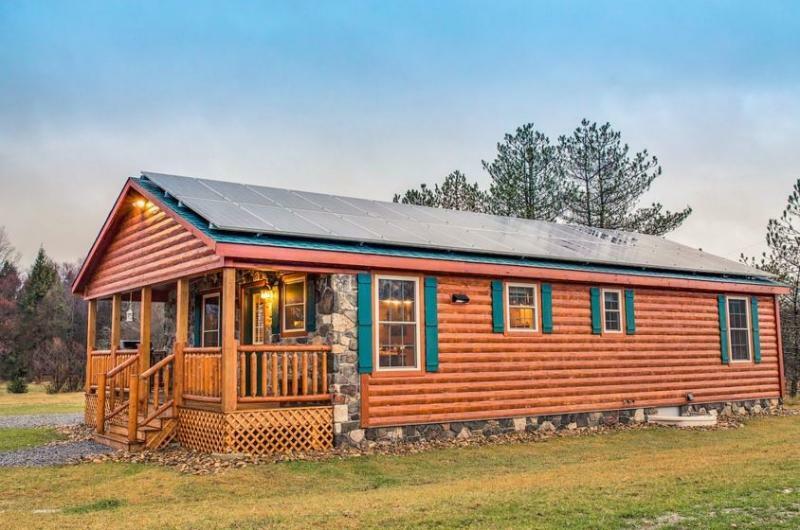 Additionally, this netzero cabin’s electricity is provided by solar panels on the roof - yet, the cabin is still conveniently grid-connected! 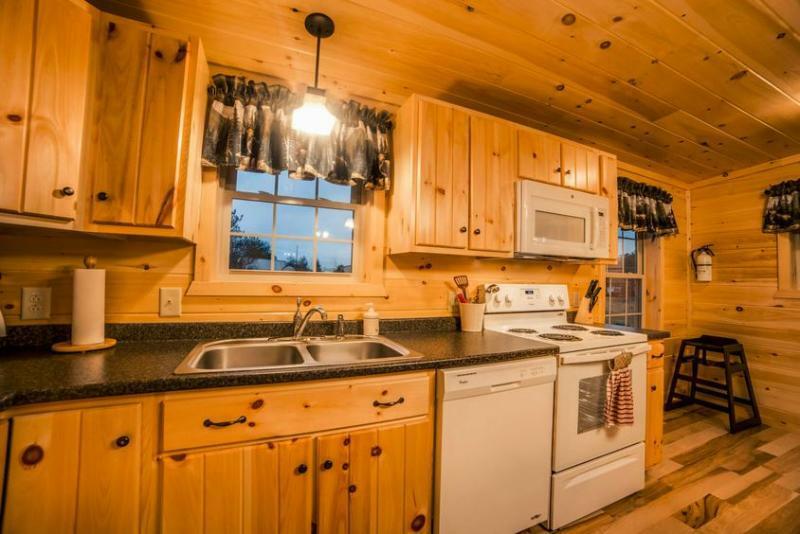 Even the most discerning chefs will love utilizing the cabin's fully equipped kitchen, complete with all essential cooking appliances. 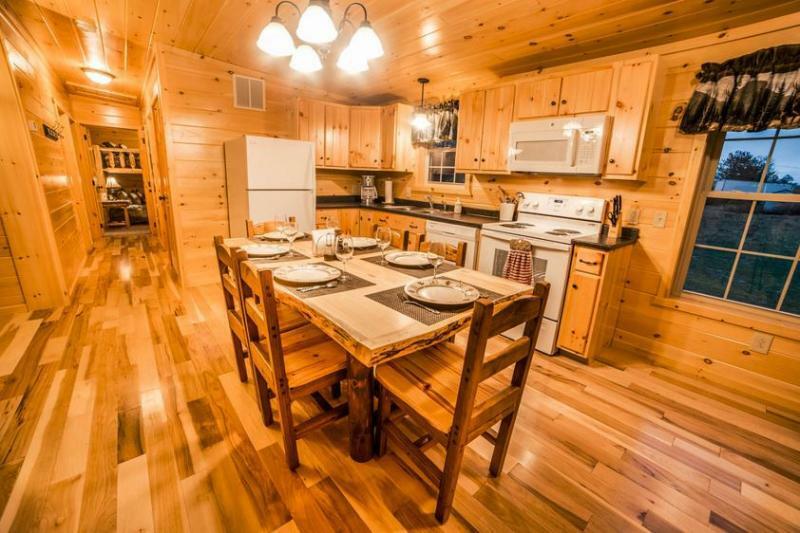 After preparing dinner in the kitchen or outdoors on the gas grill, gather around the gorgeous wood dining table in the great room, offering enough seating for 6 guests. 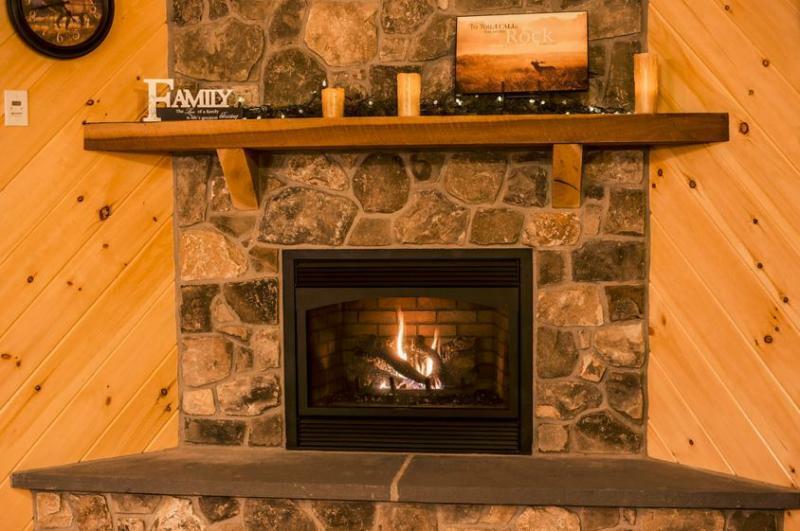 Later, have a bonfire outside or curl up by the warmth of the indoor fireplace before heading to off bed. 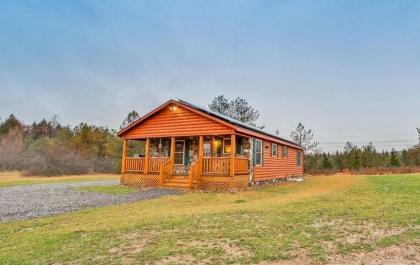 Situated within the quiet Blue Sky subdivision, perhaps the best feature of this property is its unbeatable location! 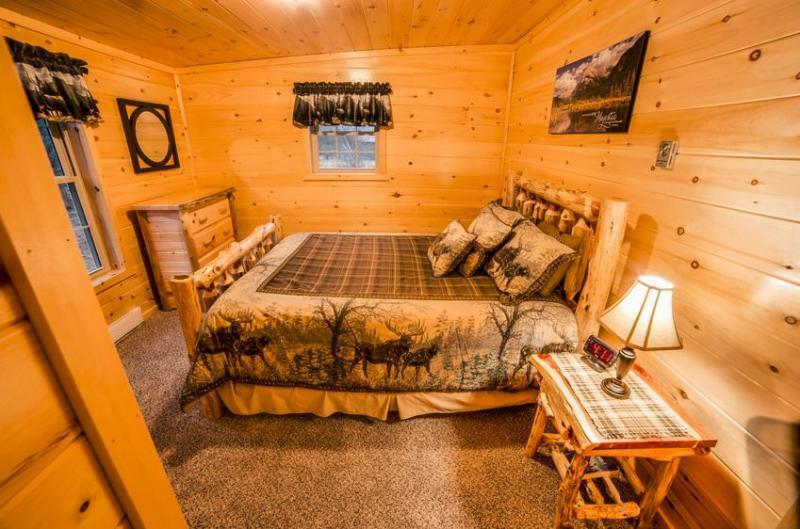 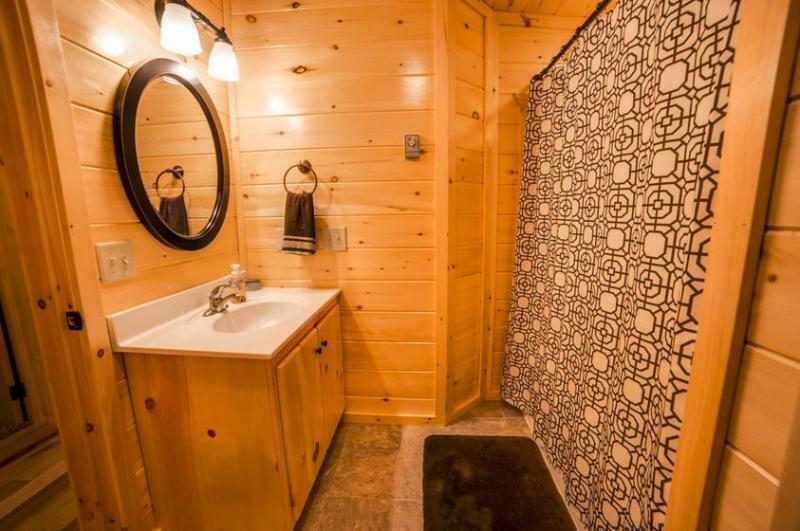 This peaceful cabin is conveniently within a 2-mile radius of all the area's most popular attractions. 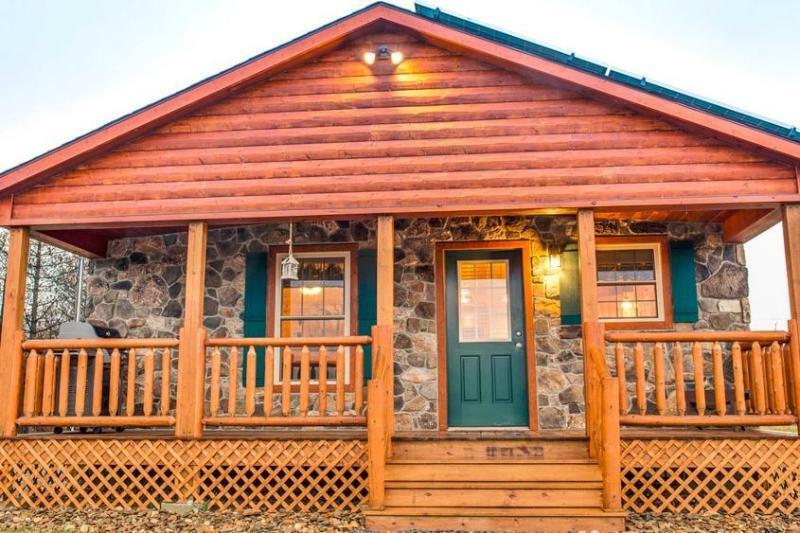 Throughout your stay, enjoy leisurely 1-mile strolls to the new Elk Country Visitor Center, which was recently built in 2010, for some family-friendly activities. 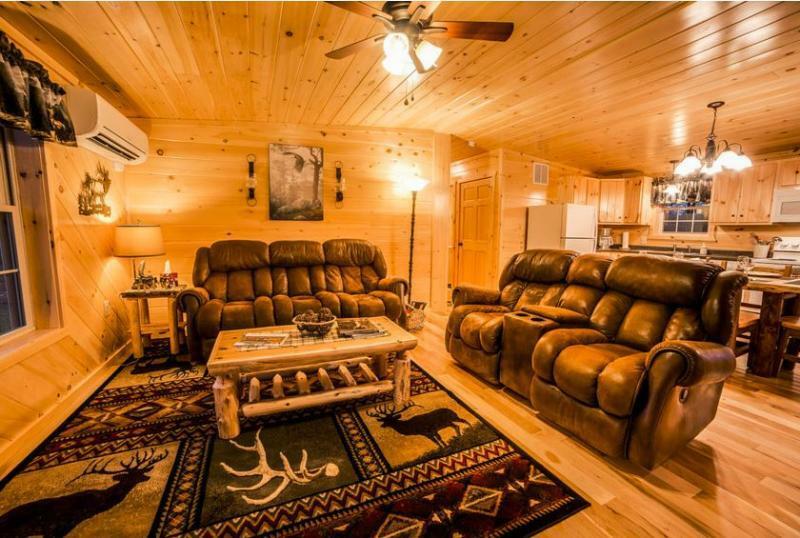 Fantastic fishing, hunting, and 4-wheeling opportunities can be found just a short walk away from the cabin! 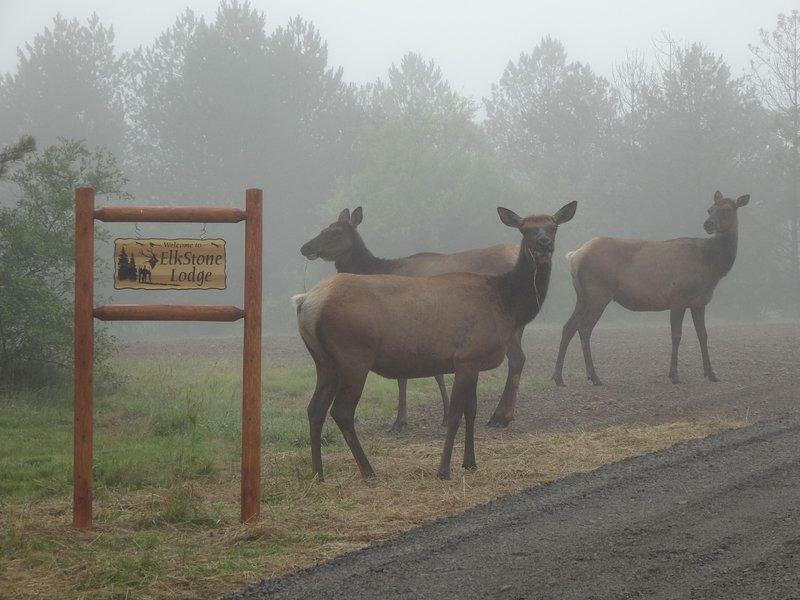 Guests of all ages will enjoy observing the multitude of elk roaming throughout the area - be sure to check out the Winslow Hill Elk Country Viewing Area just 1.4 miles from the cabin, or the 127-mile Elk Scenic Drive, which is accessible by Route 555 only 1.5 miles away. 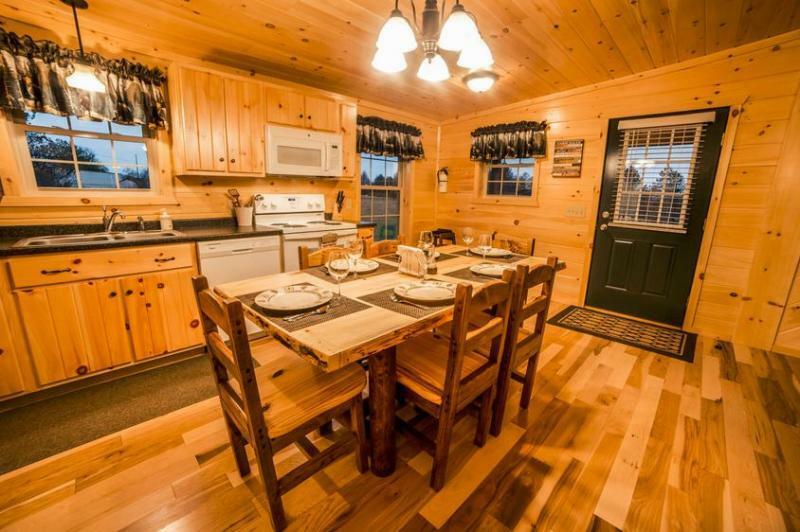 This cabin is conveniently located between 1 and 2 miles from town, where you’ll find a wide array of dining options. 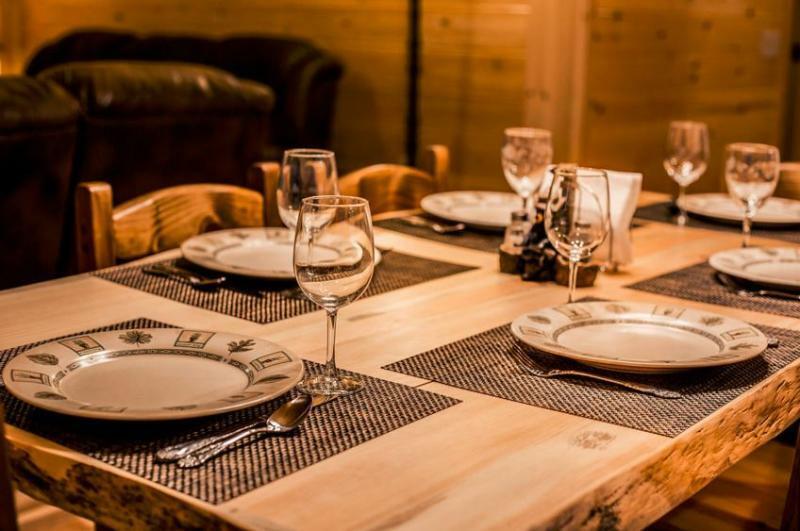 Enjoy a tasty breakfast or afternoon ice cream at the Old Bull Cafe before strolling around town. 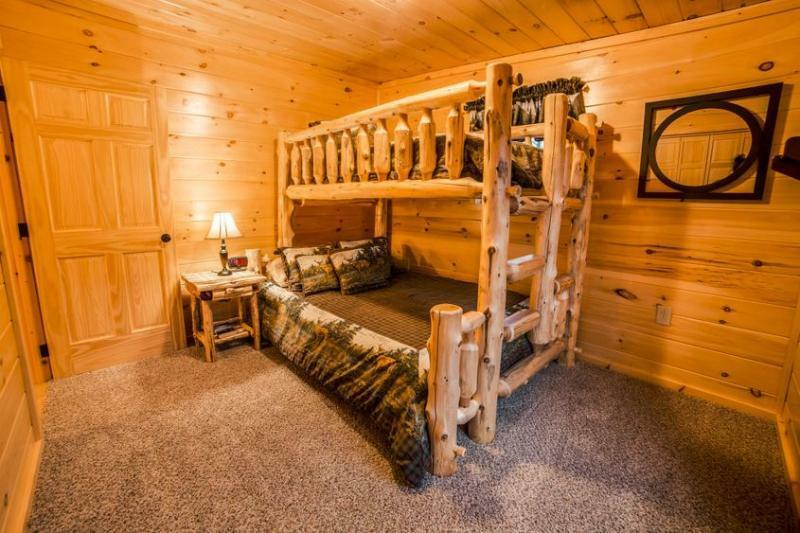 Later, head to Benezette Hotel for a lovely dinner. 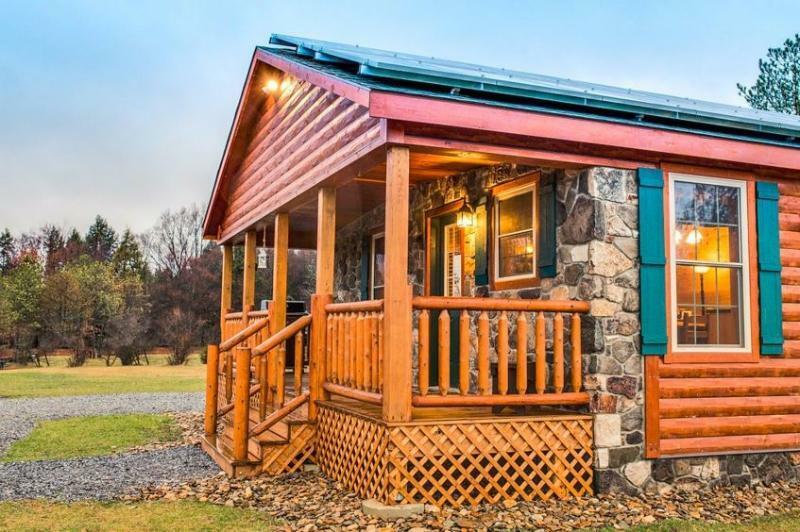 The property is also located within 2 miles of multiple wonderful wineries, where you can tour the vineyards and taste some delicious local wines. 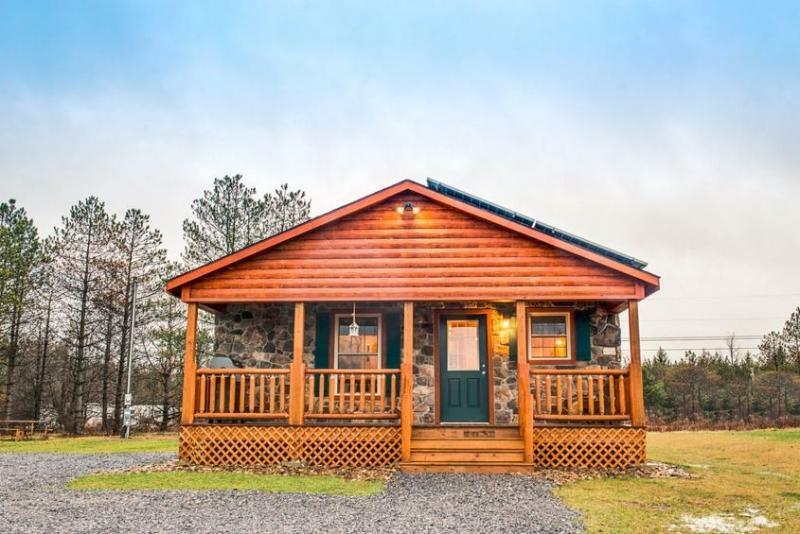 No matter how you plan to spend your time here, this wonderful Benezette vacation rental cabin will quickly become a place you look forward to returning to year after year! 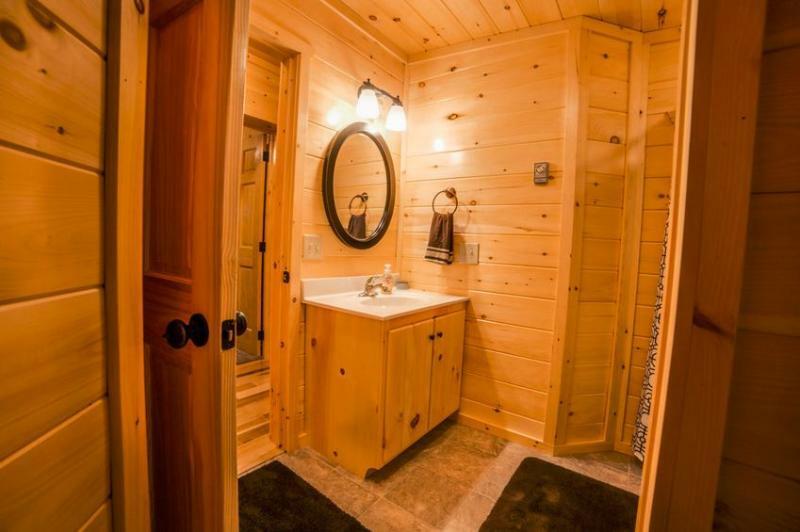 - Peaceful location on 1.5 acres of lush land within Blue Sky subdivision! 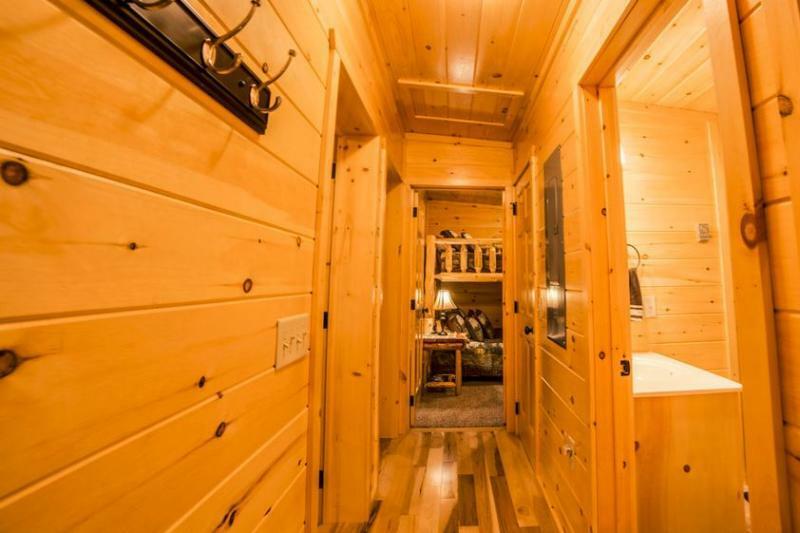 - Easy access to wineries, restaurants, outdoor activities, elk viewing, and other local attractions! 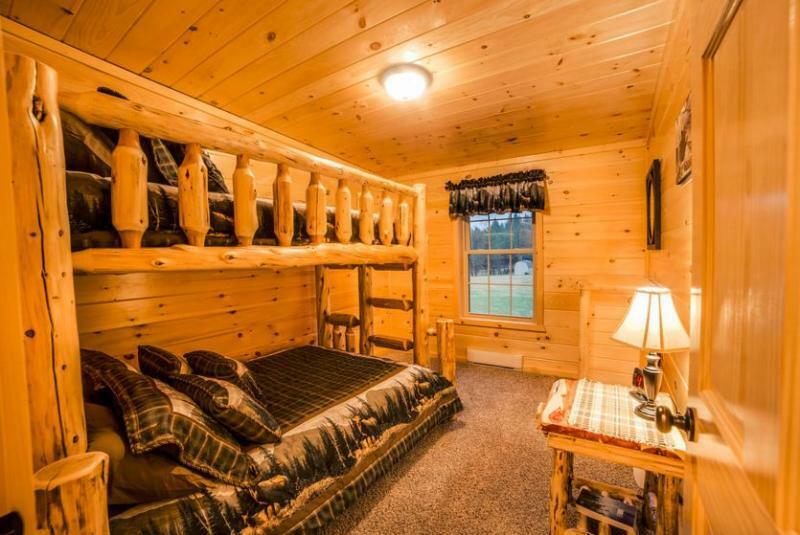 - Visit the ElkStone Lodge Facebook Page for even more great information!